Buffalo Mountain is deceptive. 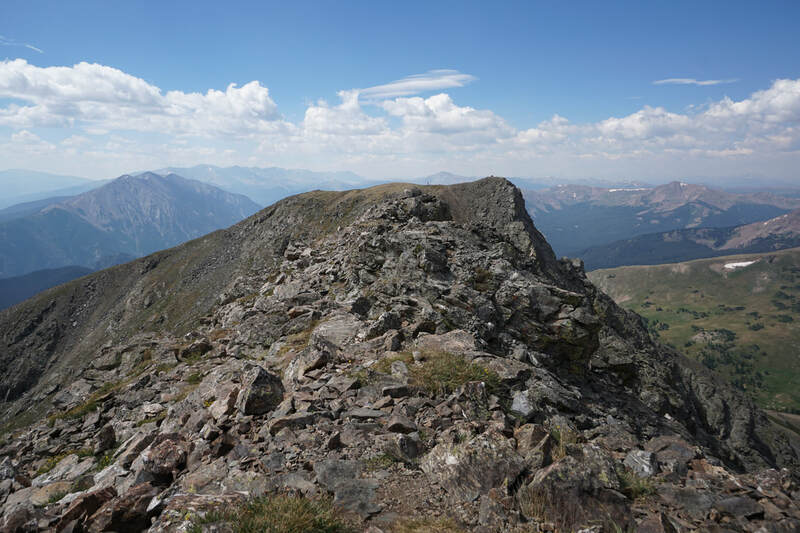 From I-70 it looks like a gentle giant with its massive rounded summit sitting comfortably against the rugged Gore Range peaks to the north. 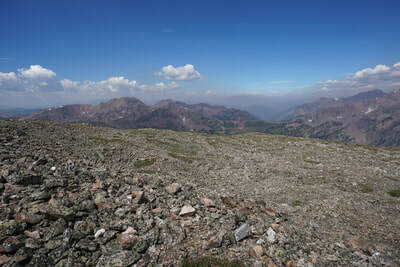 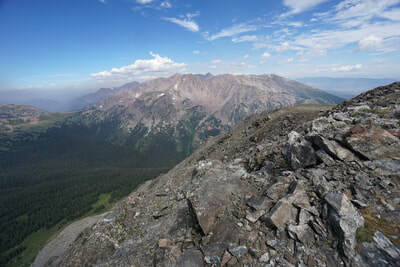 However, in reality Buffalo Mountain truly is a Gore Range Peak, rugged and unforgiving. 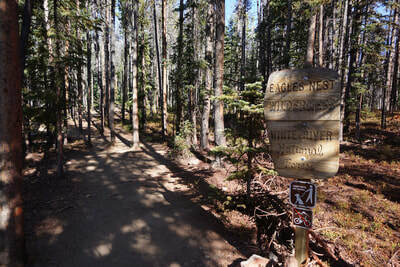 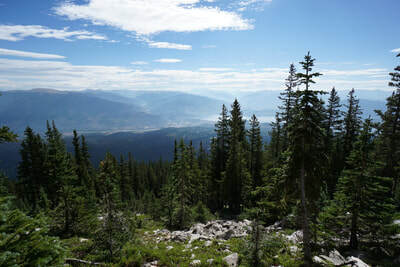 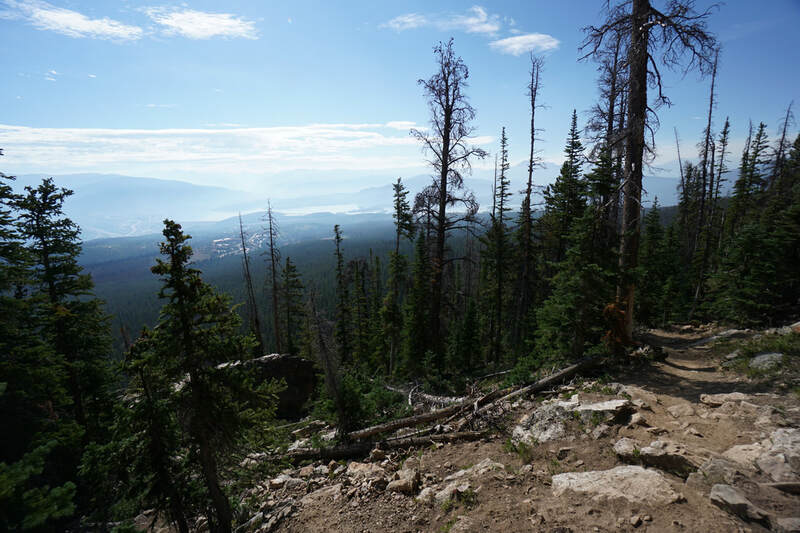 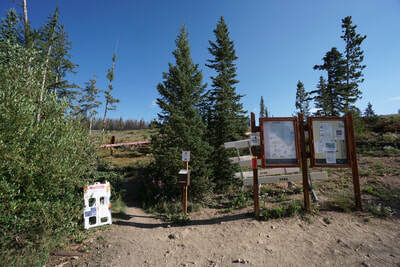 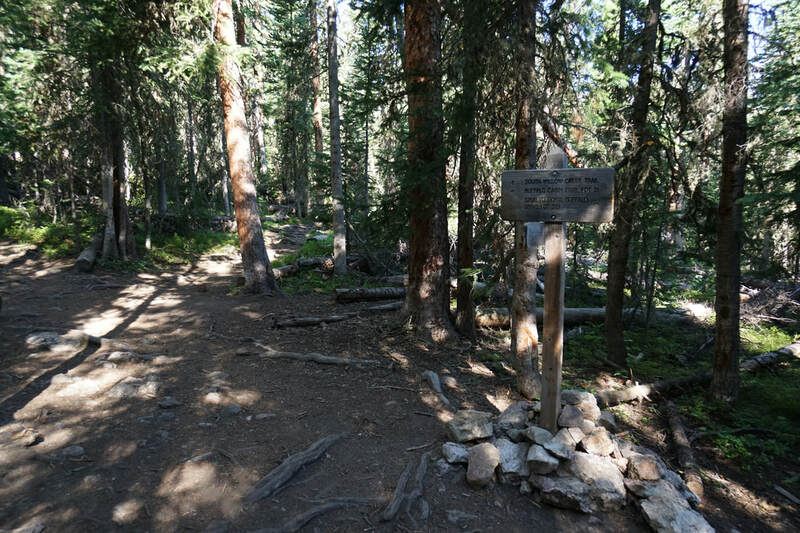 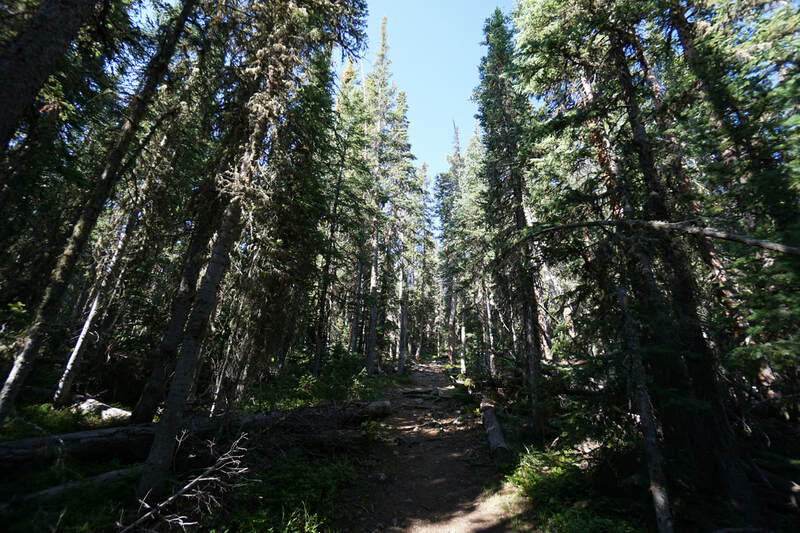 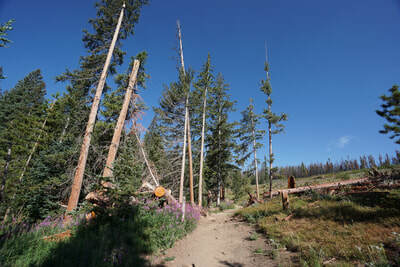 The hike up the Buffalo Cabins Trail, while short at 5.5 mi (RT), will test your willpower. 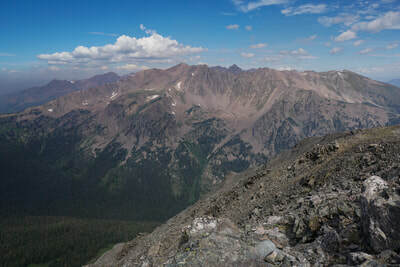 The views from the narrow ridge that makes up the summit, are nothing short of spectacular so keep on hiking, the effort is worth the reward. 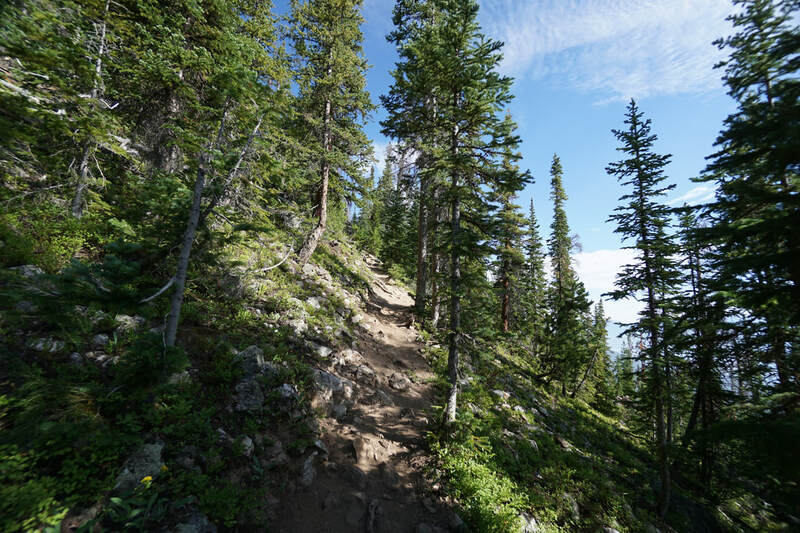 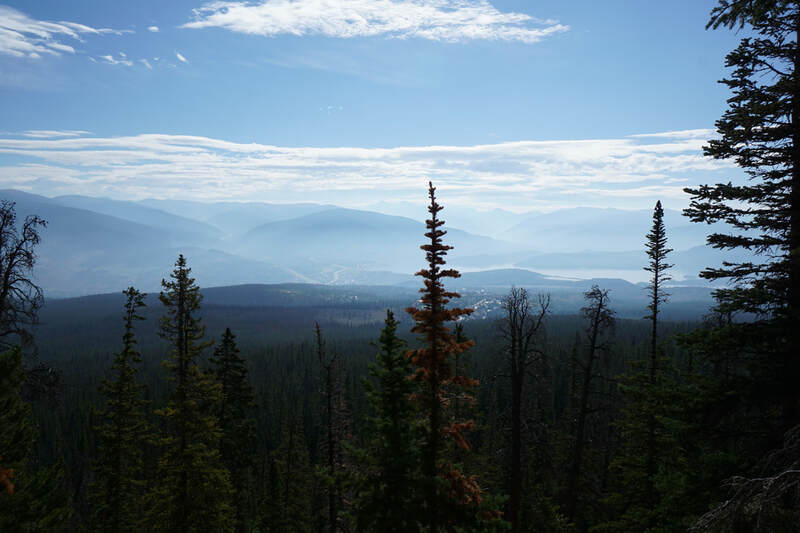 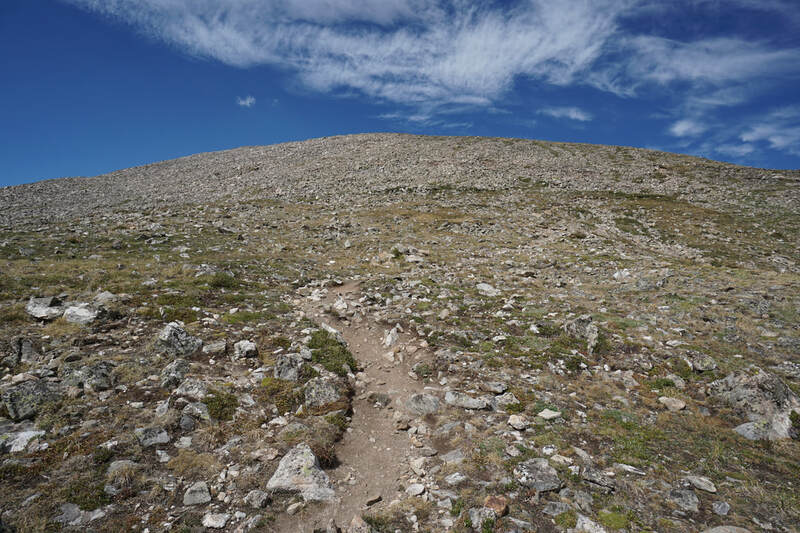 The trail can be broken down into three sections, a steep climb through dense pine forest, a steep climb across a massive boulder field, and a steep climb across the open tundra...are you sensing a pattern? This hike is steep, climbing more than 3,000 feet in less than 3 miles, with a flat .6 miles to start. 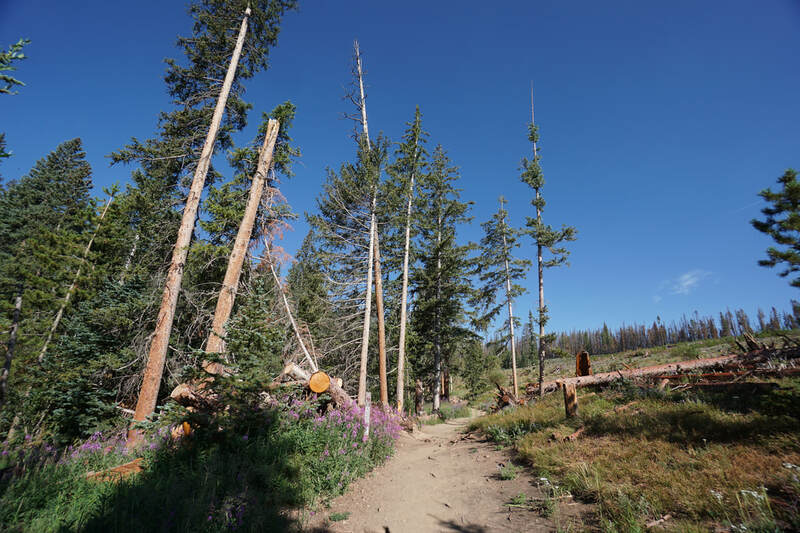 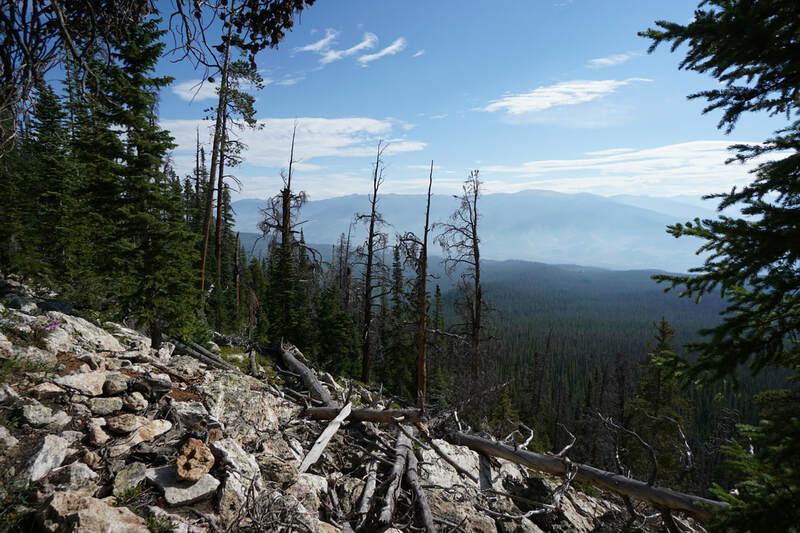 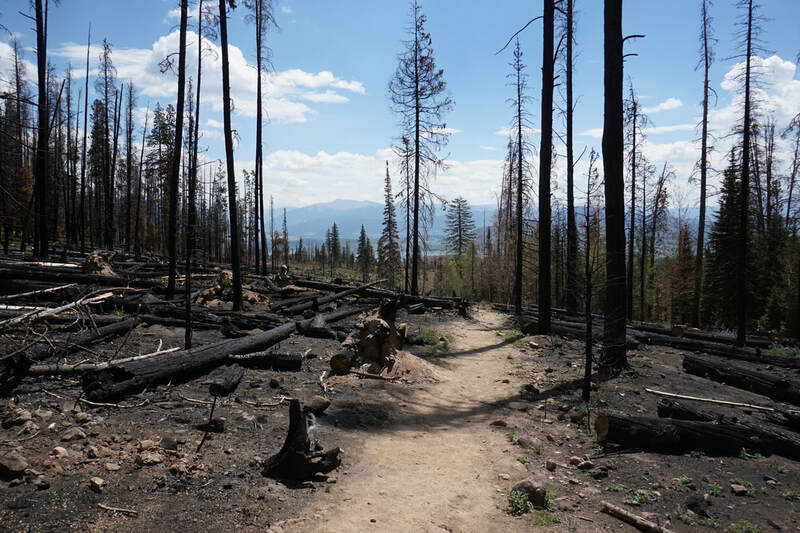 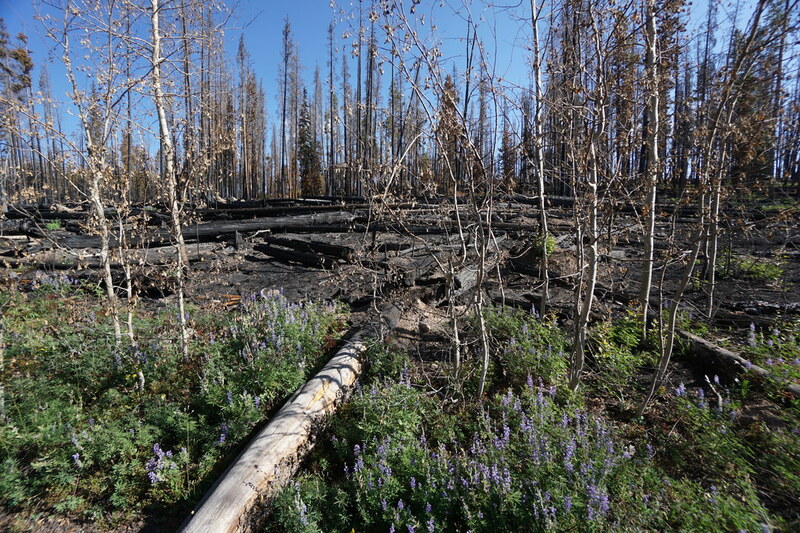 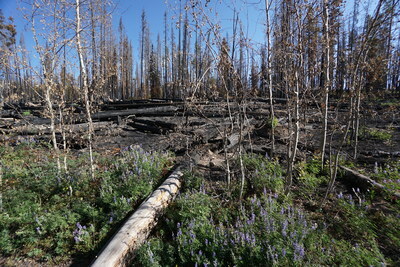 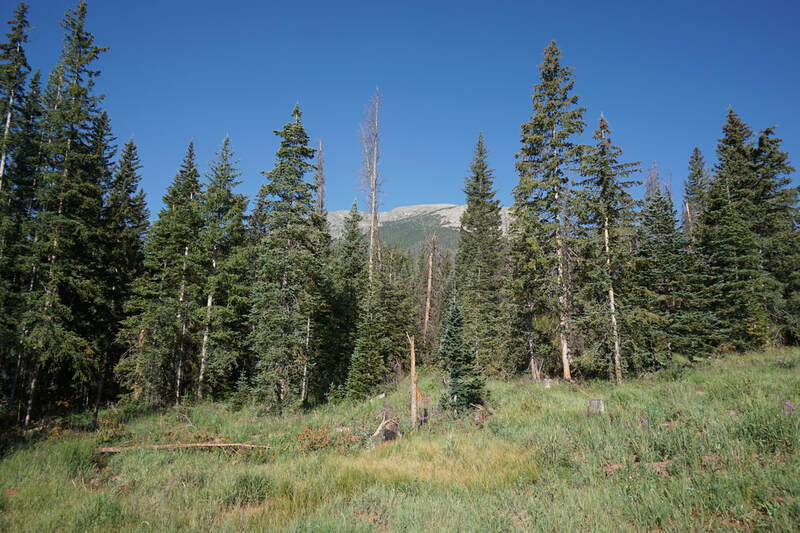 From the Buffalo Cabin Trailhead, the hike begins by crossing a burn area, the blackened trees provide a stark contrast the the colorful wildflowers growing in the now fertile soil. 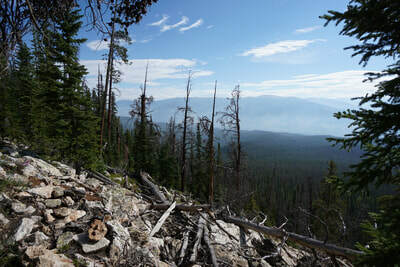 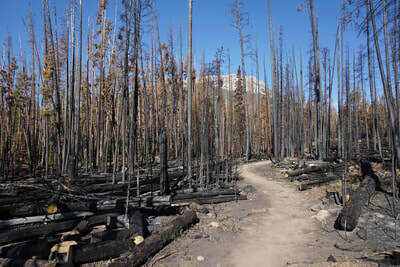 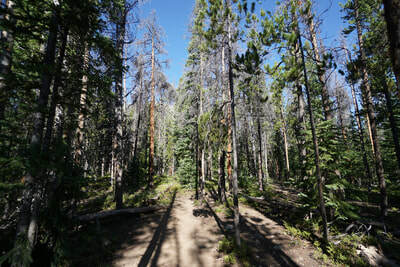 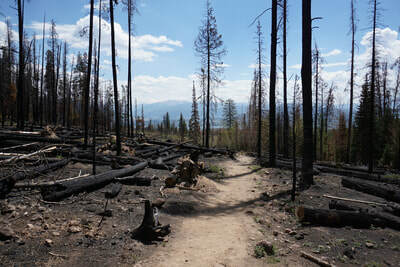 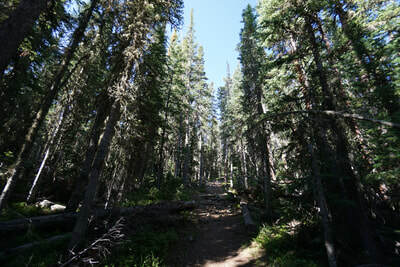 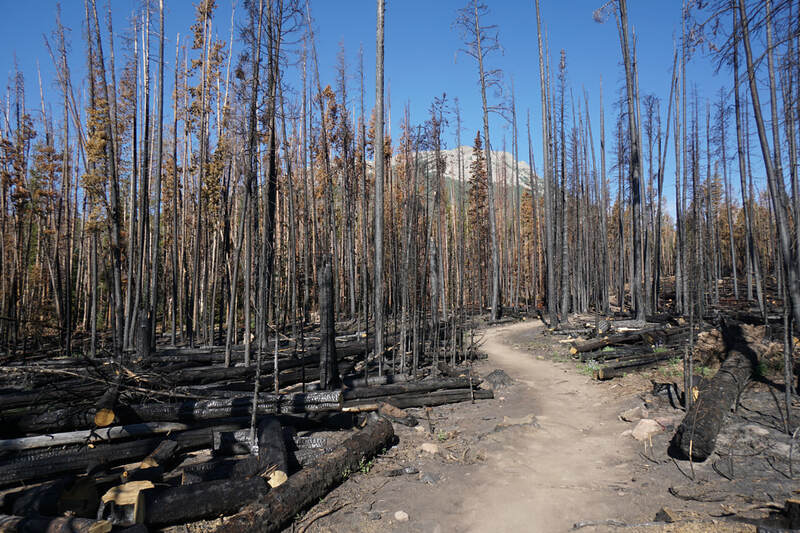 After the burn area, the hike rambles through dense pine forest for .6 miles until you reach the junction with the South Willow Creek Trail. 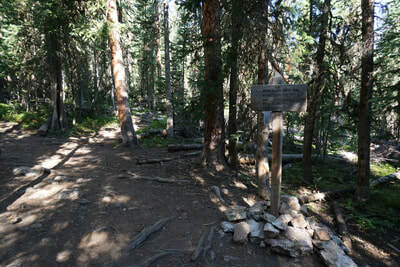 Turn left following the sign for the Buffalo Cabin Trail. 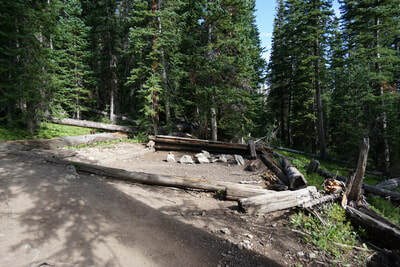 From here, the trail gets a bit steeper through the woods and switchbacks past some old remains of historic cabins (hence the name of the trail). 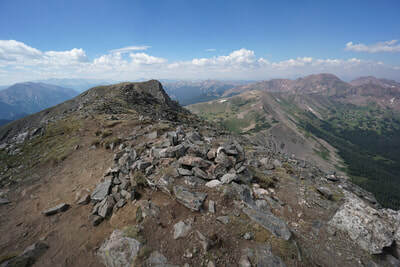 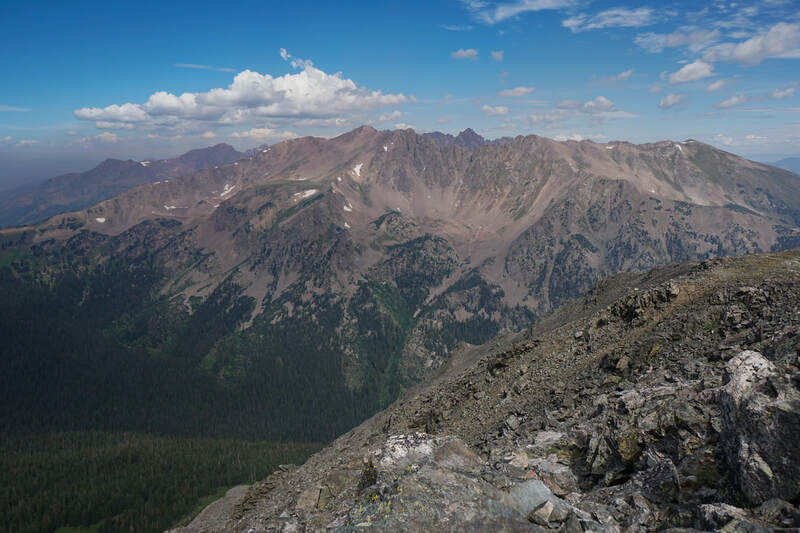 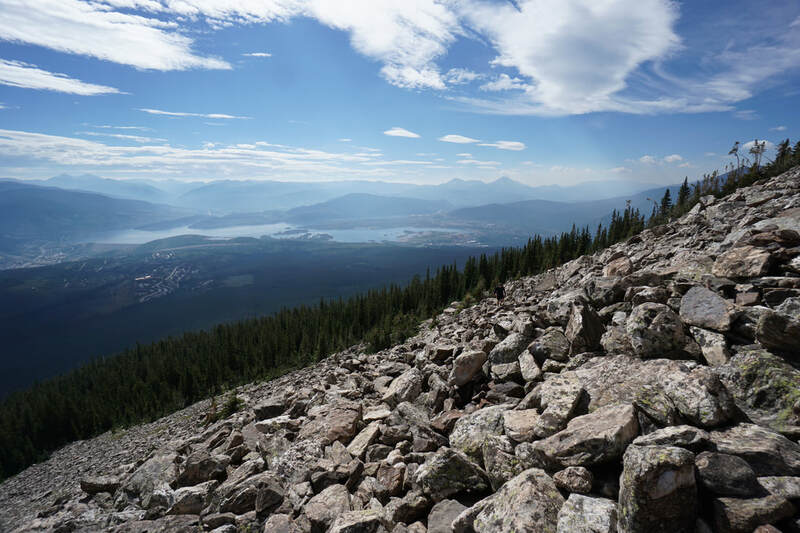 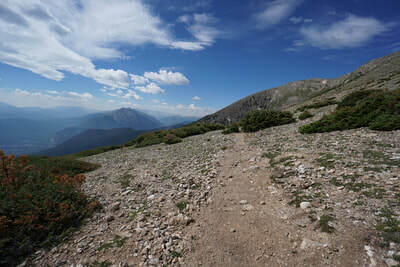 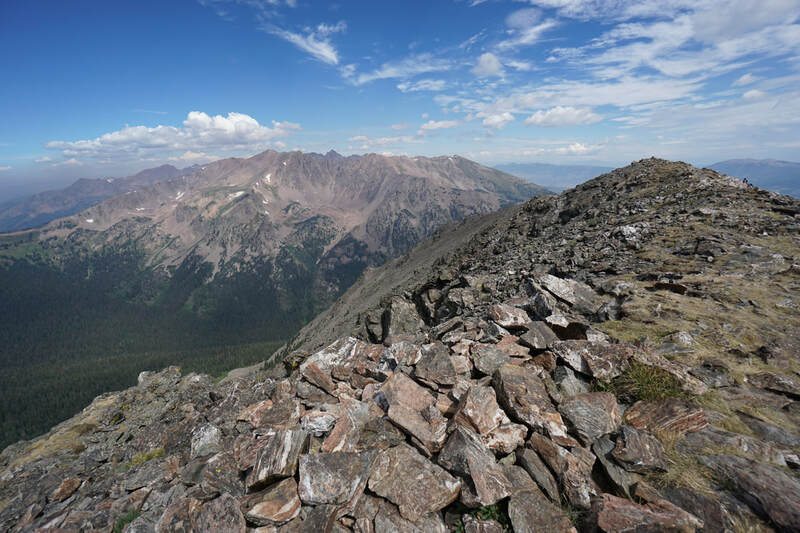 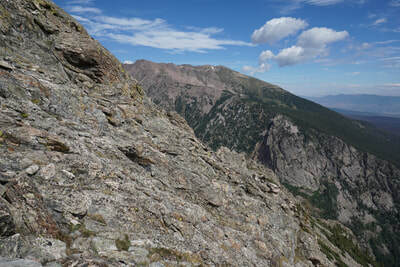 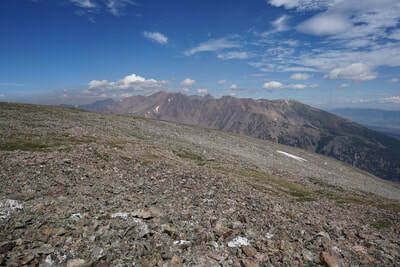 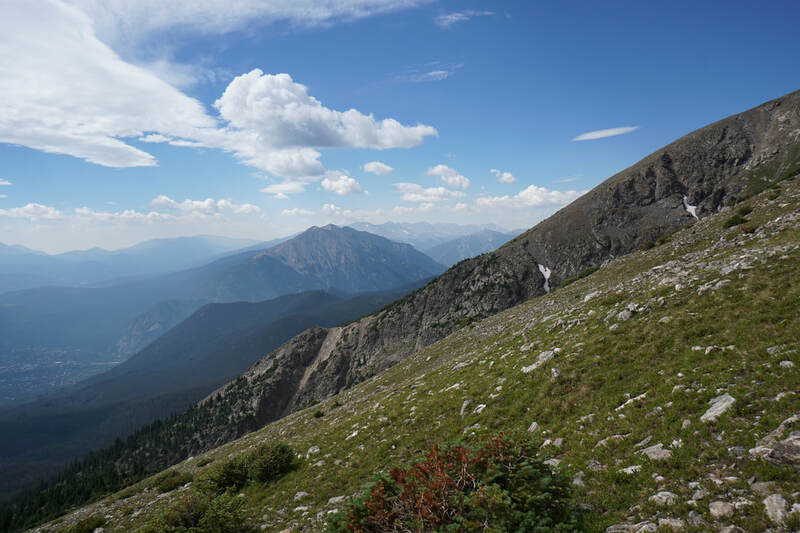 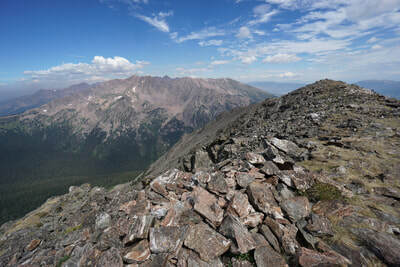 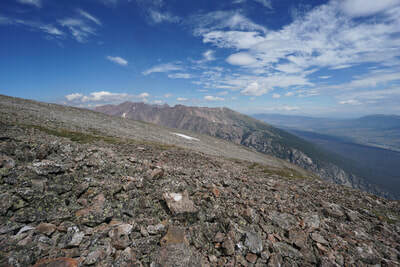 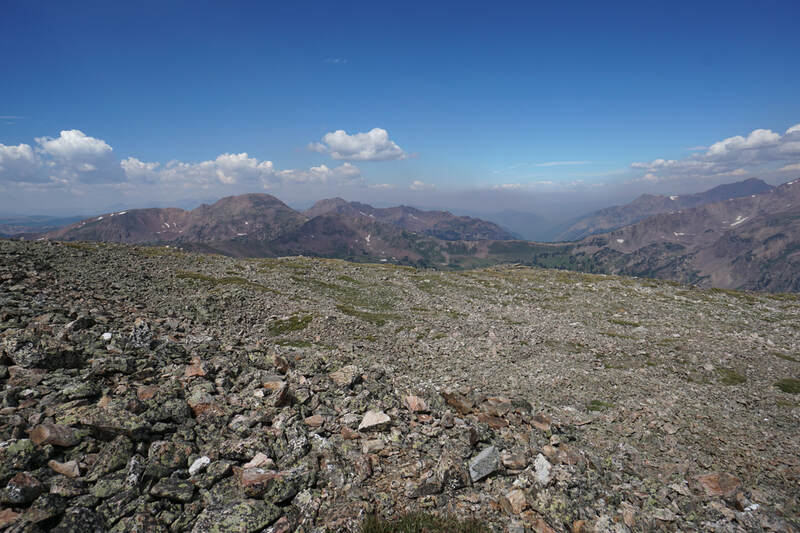 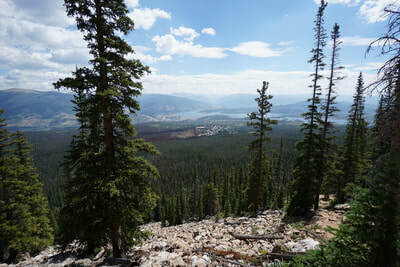 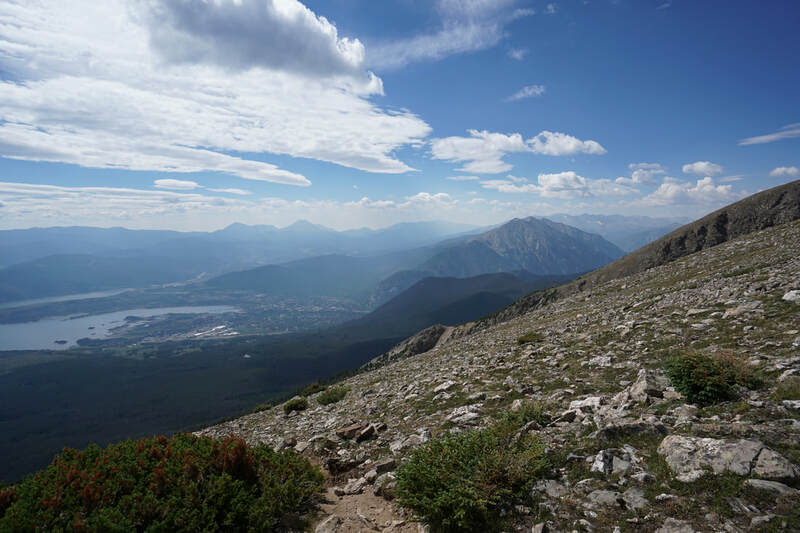 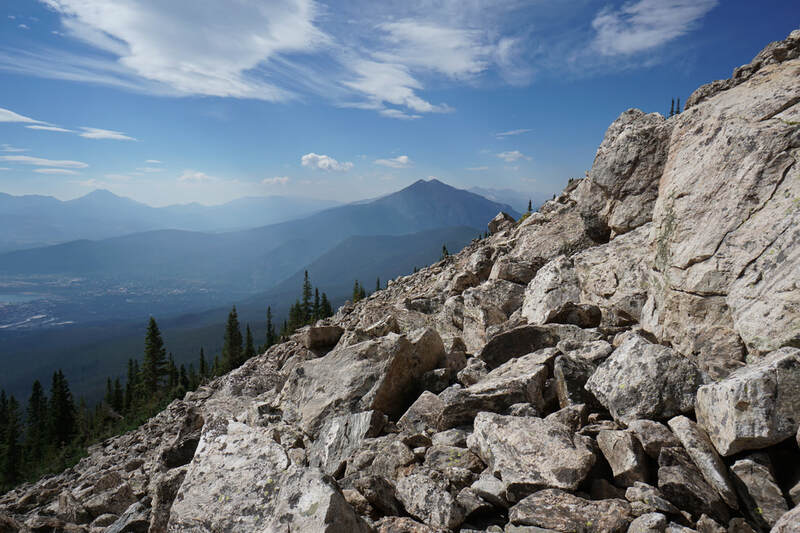 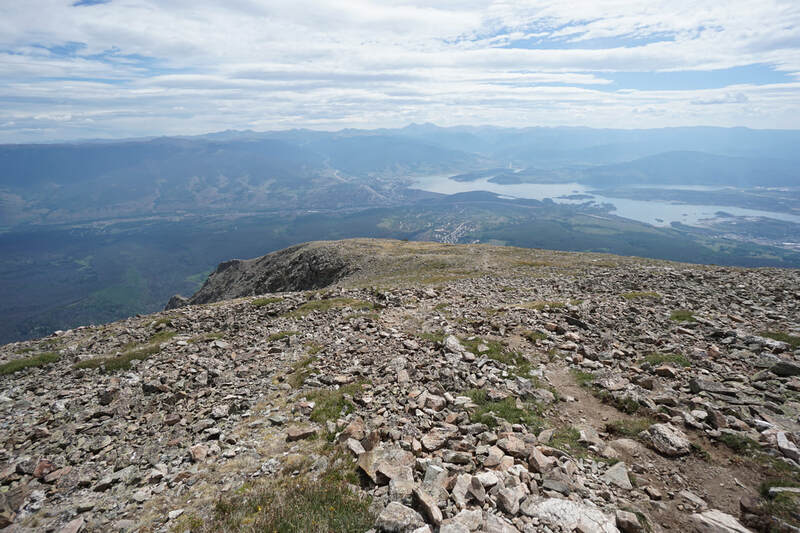 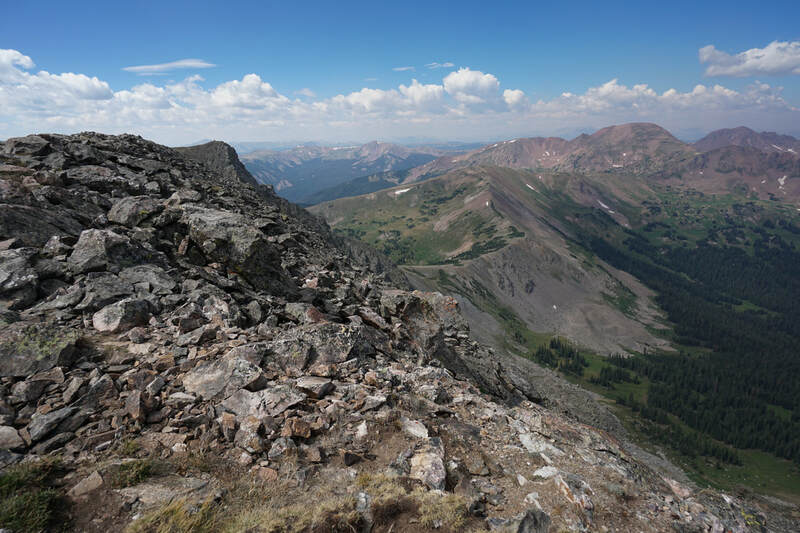 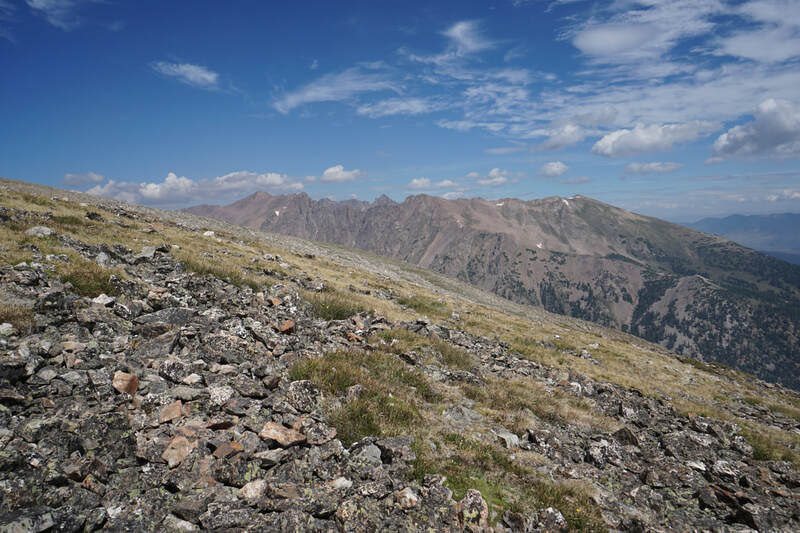 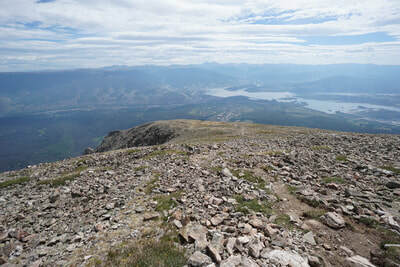 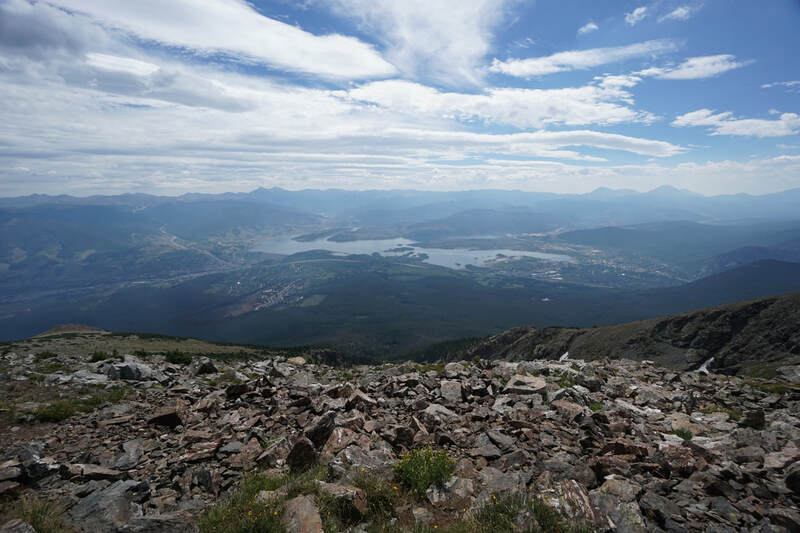 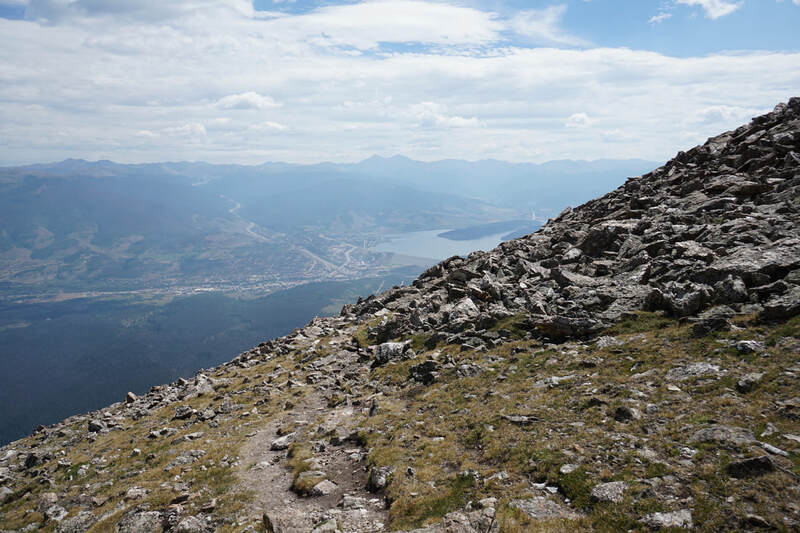 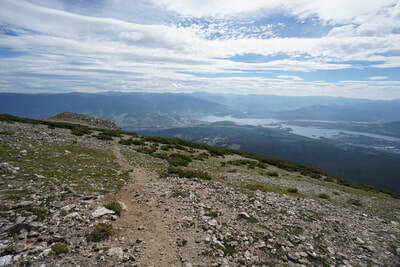 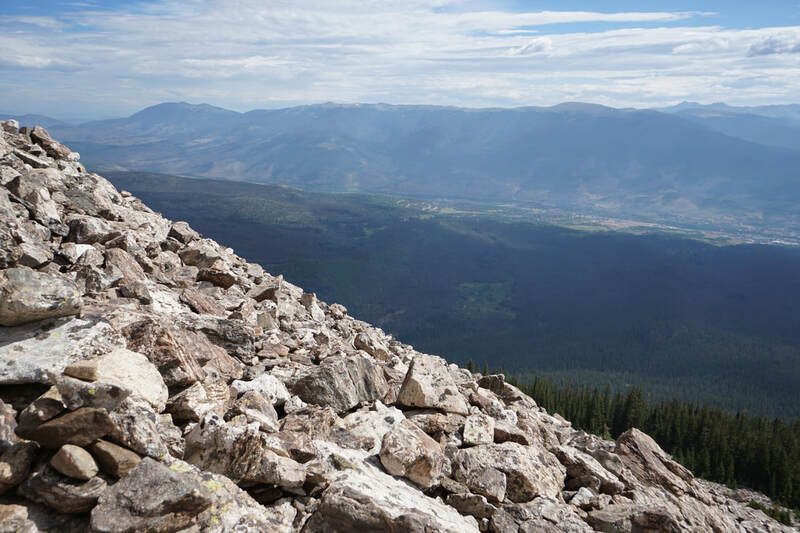 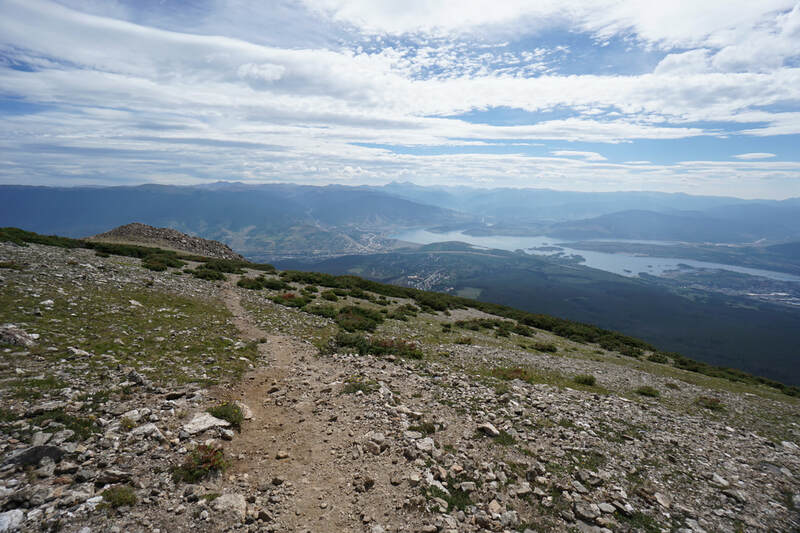 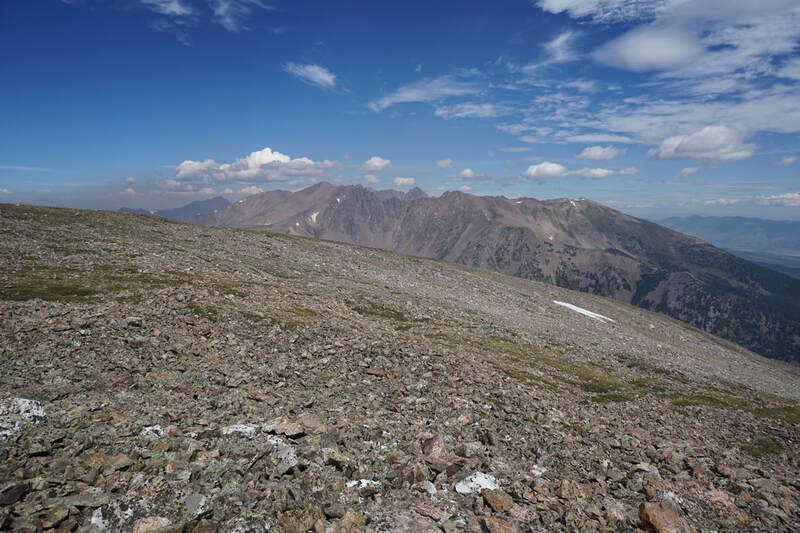 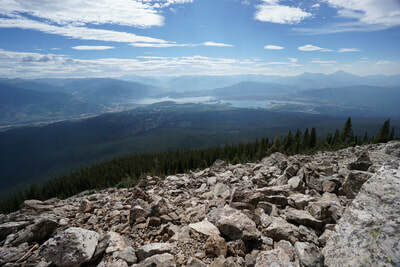 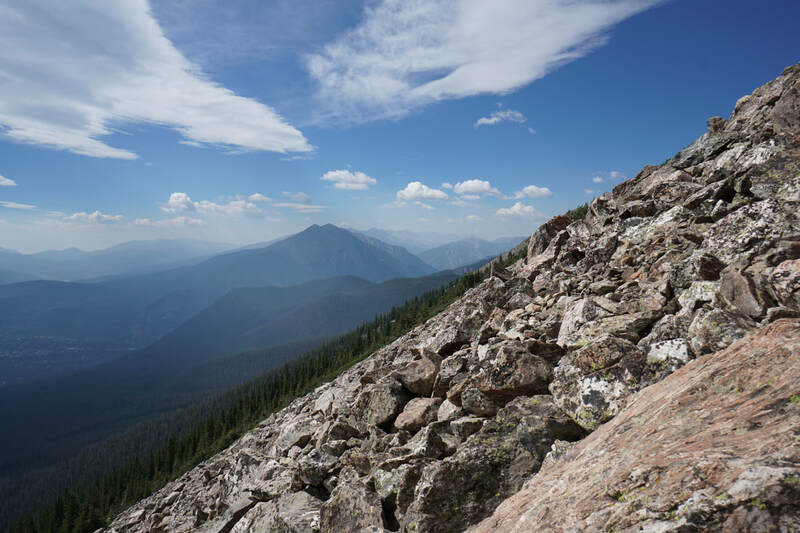 As the trail gets steeper, rocky outcrops start to provide views to the east with Dillon reservoir and the Front Range mountains beyond, including great views of Grays and Torreys Peaks looming in the distance. 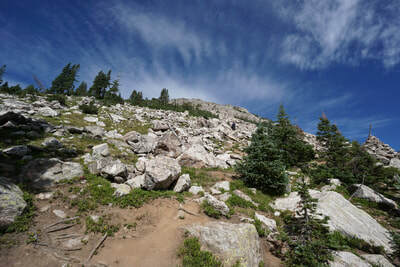 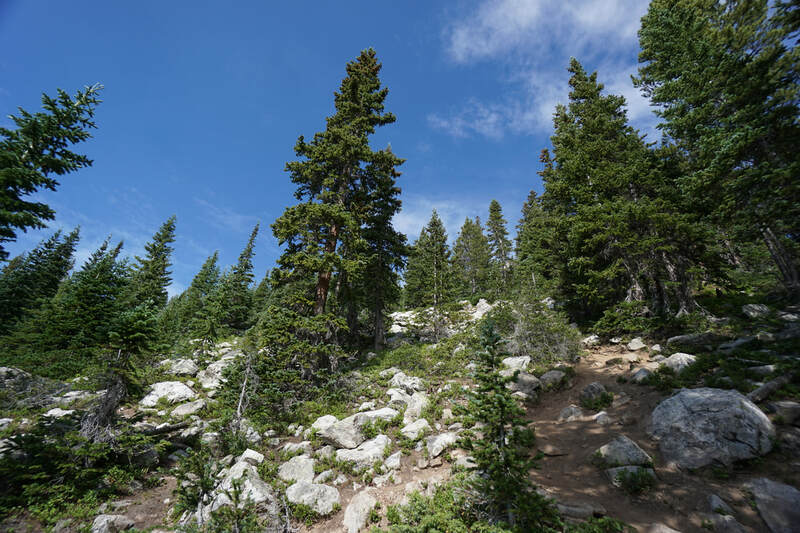 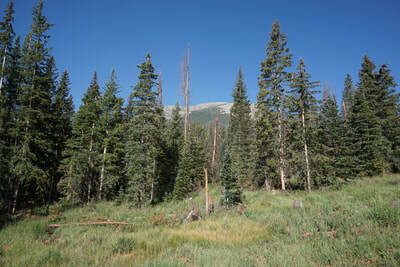 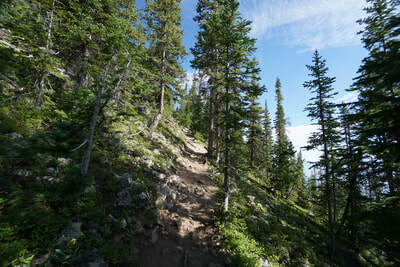 Before too long, the trail pops out of the forest at treeline and the infamous boulder field begins. 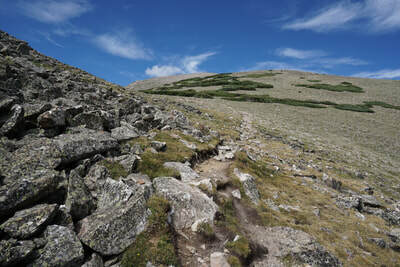 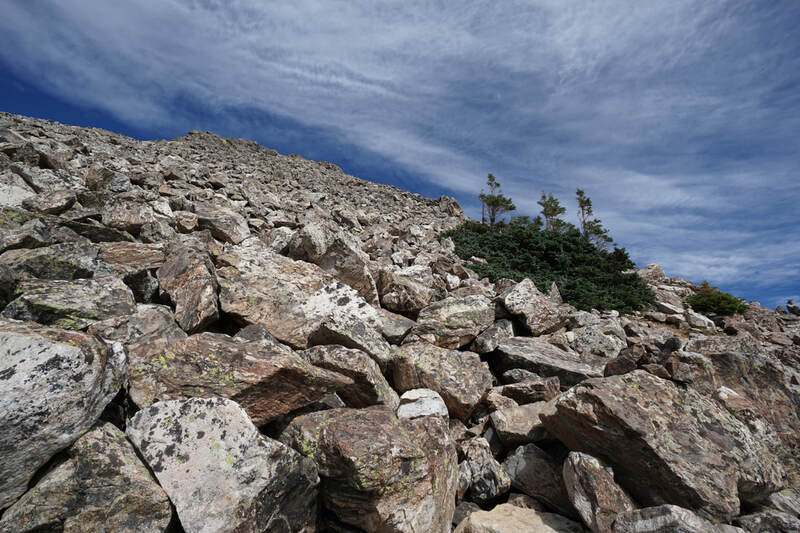 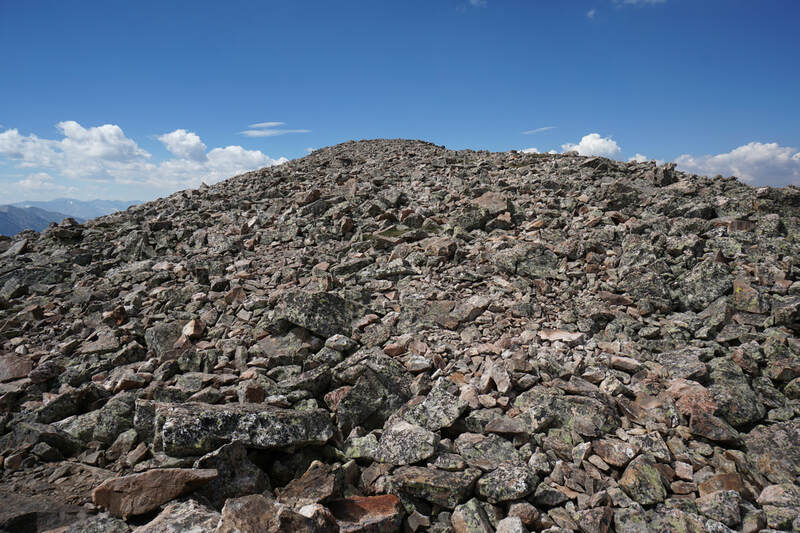 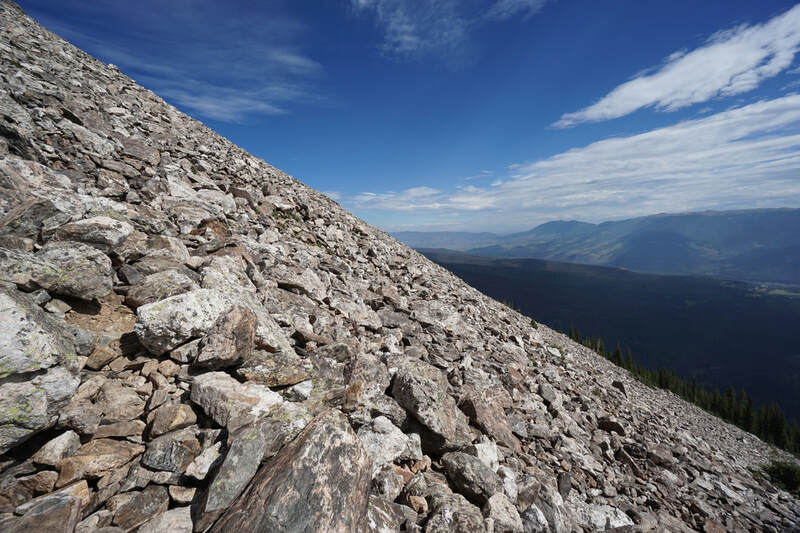 The boulder field is a challenging section of trail that consists of cairns leading you up through the field via a series of steep switchbacks. 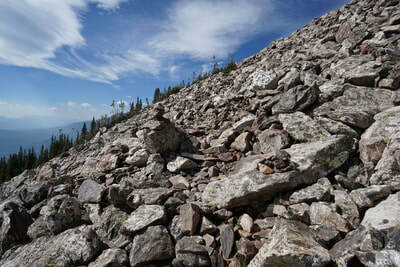 This is sustained boulder hoping that requires full concentration, mostly so you don't veer off the "trail." 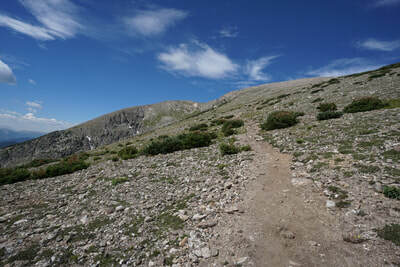 That being said, the trail is well cairned and you should always be able to see the next cairn. 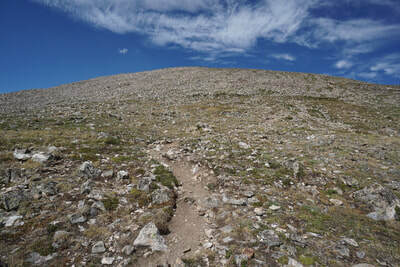 The trail is a switchback so don't look directly up slope for the next cairn, and if you find yourself climbing straight up the slope with no cairns then you are probably off track. 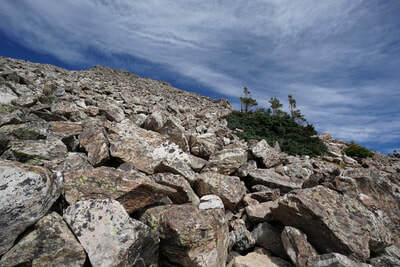 Keep going and eventually the boulders will end and you'll be on solid earth again. 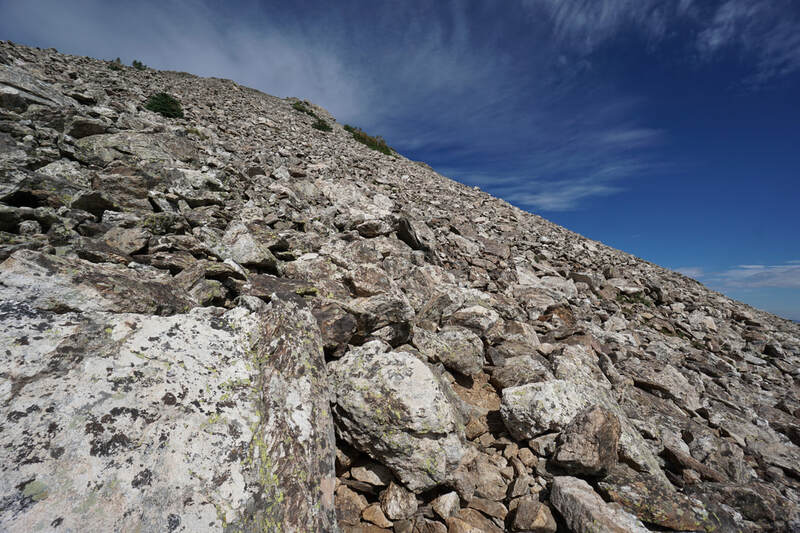 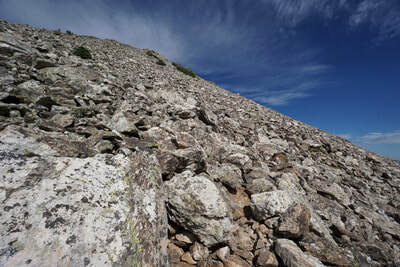 Happy to no longer be boulder hopping, the final segment of the hike takes you up through the tundra to the summit ridge. 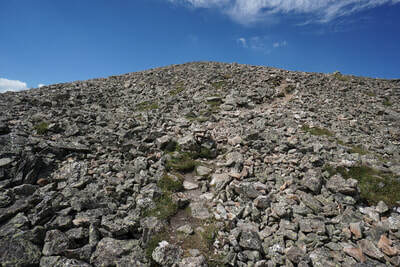 The climb is steep in places but far less diffucult than the boulder field. 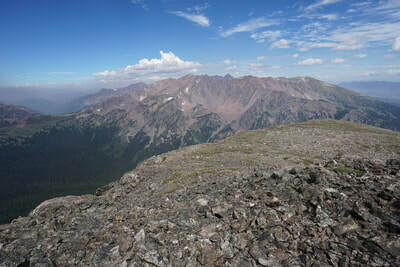 The views, of course, are amazing and when you finally reach the summit ridge, the views get even better. Buffalo Mountain is a wonderful vantage point to take in the Gore's many jagged peaks. On a clear day, you can see the Gore Range, the Tenmile Range, and the Front Range. 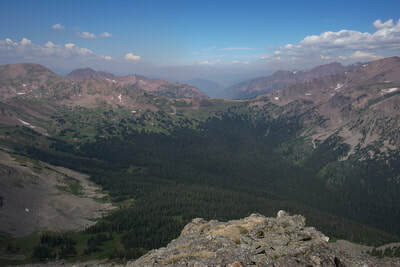 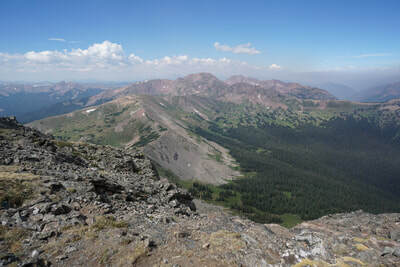 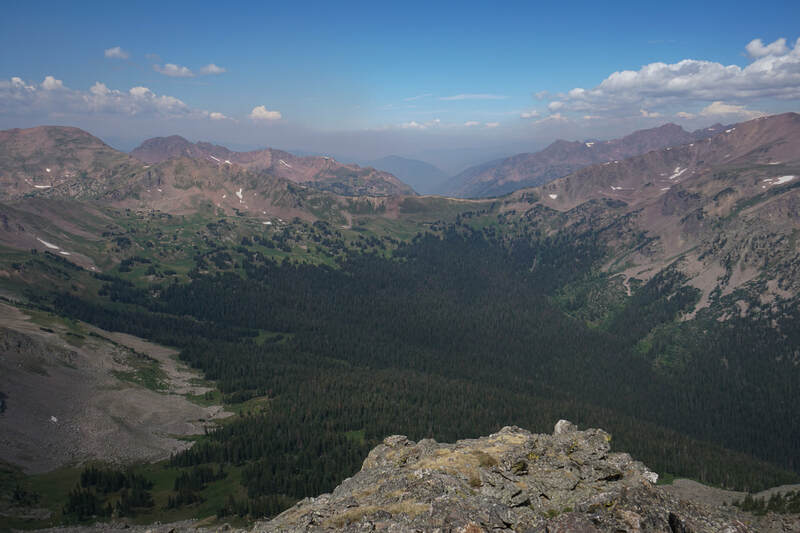 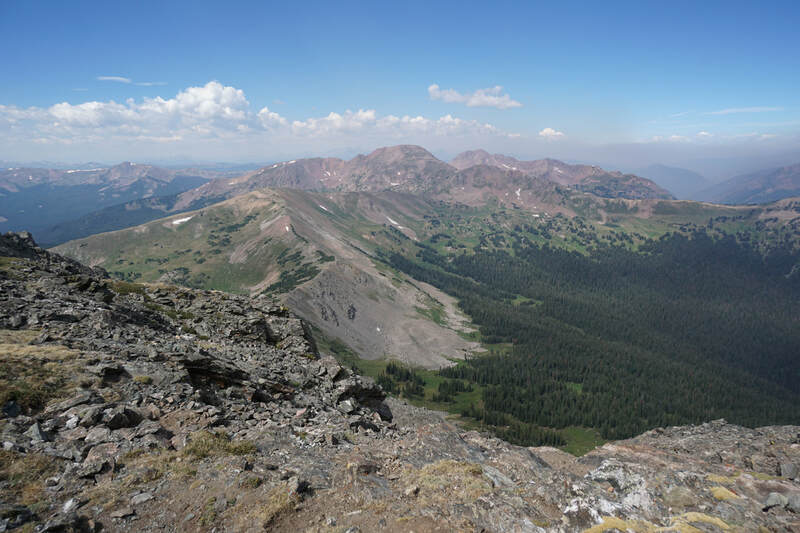 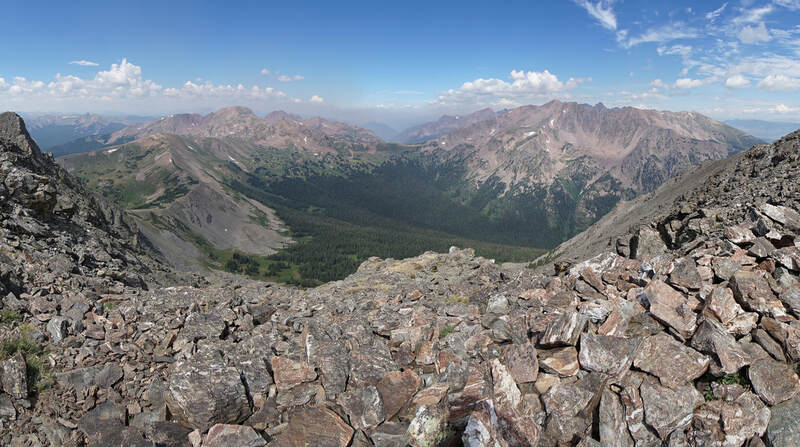 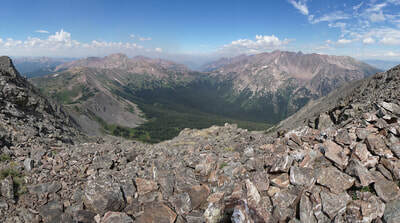 You'll also be looking down on Eccles Pass and Red Buffalo Pass, and across to the rugged 13er, Red Peak. 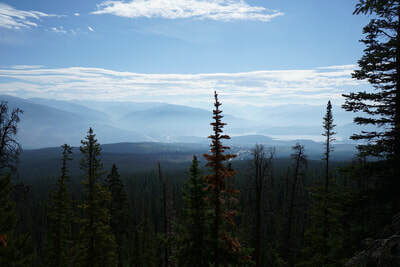 Take it all in. 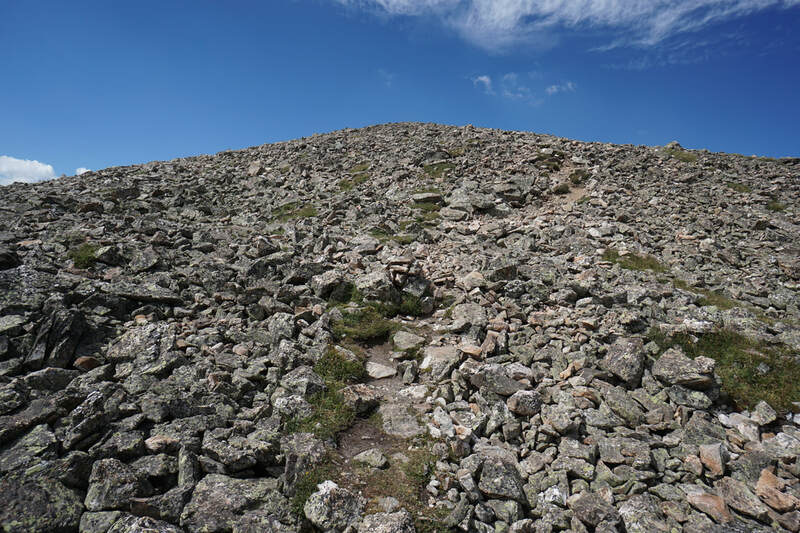 You have finally reached the north summit of Buffalo Mountain, if you want to continue a bit further, you can follow the trail across the narrow ridge to the South Peak. 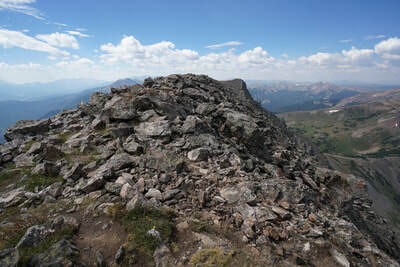 The ridge requires a bit of scrambling but doesn't seem too difficult. Relax at the summit and stretch out your quads and your calf muscles, you still need to climb down the boulder field... Short, strenuous, and sweet, Buffalo Mountain is deceptively difficult, but well worth the pain. 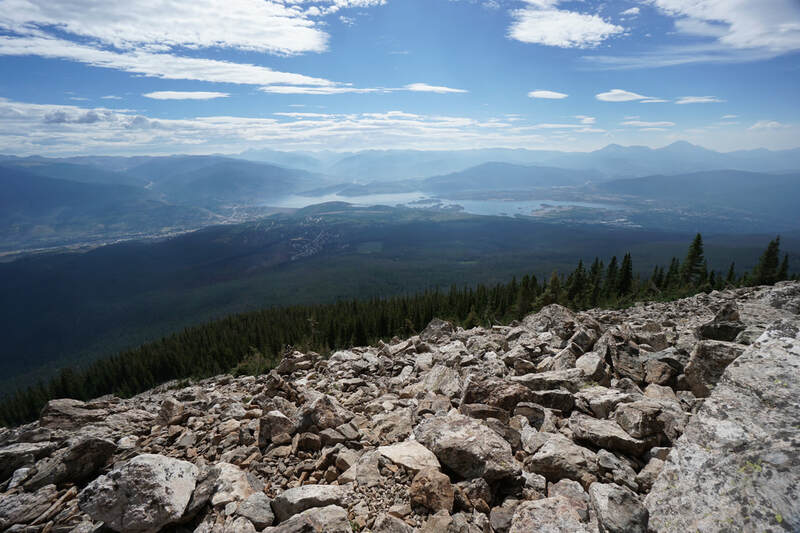 Considering that you've probably driven by this mountain thousands of times, it's a real treat to climb and see it from the top. 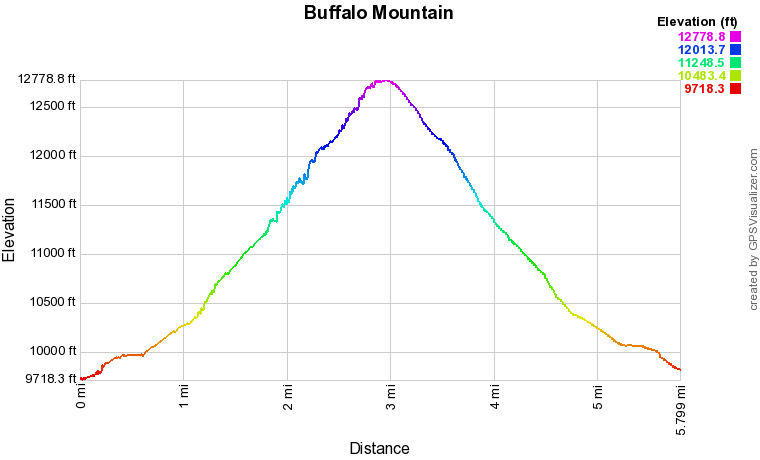 You'll never look at Buffalo Mountain the same again.